Delaware wildfire crew: Front row (from left) Michael Valenti of Dover, Mark Kammer of Magnolia, Rocco Hladney of Middletown, Eddie Boyer of Ellendale, Christian Mihok of Magnolia, James Charney of Felton, Kevin Popowich of Pennsylvania, Mike Krumrine of Felton, Zachary Brown of Harbeson, Dan Mihok of Vermont, Blake Moore of Milford, and Todd Shaffer of Maryland. Back row (from left) Robert Young of Townsend, Robert Terry of Magnolia, Kurt Bryson of Wilmington, Robert Robles of Dover, Ryan Krammes of Newark, Jeff Wilson of Clayton, Scott Veasey of Millsboro, and Tyler Thompson of Smyrna. 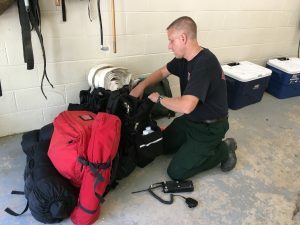 SMYRNA – The Delaware Forest Service is sending a crew of 20 wildland firefighters to the Northern Rockies to help battle wildfires in the West as the National Fire Preparedness Level is now at the maximum of 5 on a 5-point scale. The team is flying from Harrisburg to Missoula, Montana (MSO) on Sunday, August 5. 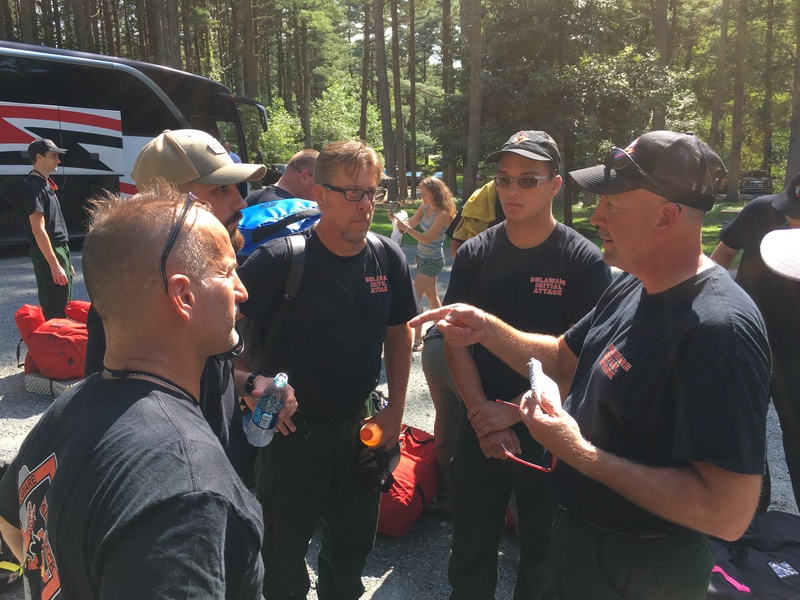 James Charney of Felton (at right) gives a squad briefing to Delaware wildfire crew members (from left) Mark Kammer of Magnolia, Robert Robles of Dover, Robert Terry of Magnolia, and Rocco Hladney of Middletown. From left, Todd Shaffer listens to crew boss Mike Valenti of Dover, Delaware’s state forester, as Kevin Popowich looks on. 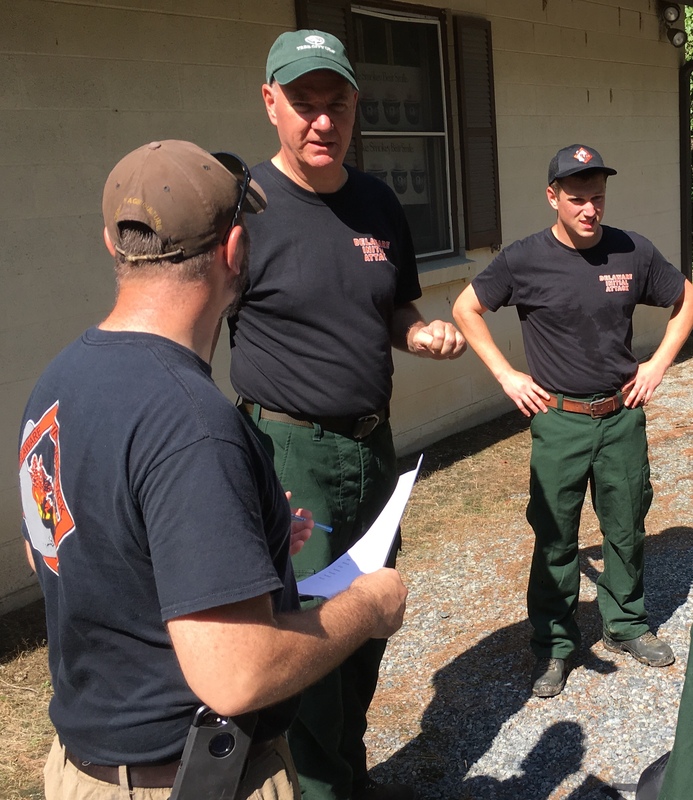 Delaware’s wildfire crew mobilized at Blackbird State Forest yesterday and is headed to Montana. With large fires burning in Califormia, Oregon, and other western states, skilled firefighting resources are in demand. A National PL of 5 means that “national mobilization is heavily committed… active geographic areas must take emergency measures to sustain incident operations… and potential for emerging significant wildland fires is high.” Nationwide, 134 active incidents are burning 1.56 million acres. A total of 587 wildfire crews and 28,994 personnel were currently committed to firefighting operations as of August 5. Photos can be found on Facebook at http://www.facebook.com/DelForestService. Veteran firefighter Mike Krumrine of Felton packs his gear at Blackbird State Forest for the trip out West with the Delaware wildfire crew. Delaware also has a Type 6 engine currently committed to the Ferguson Fire in California. 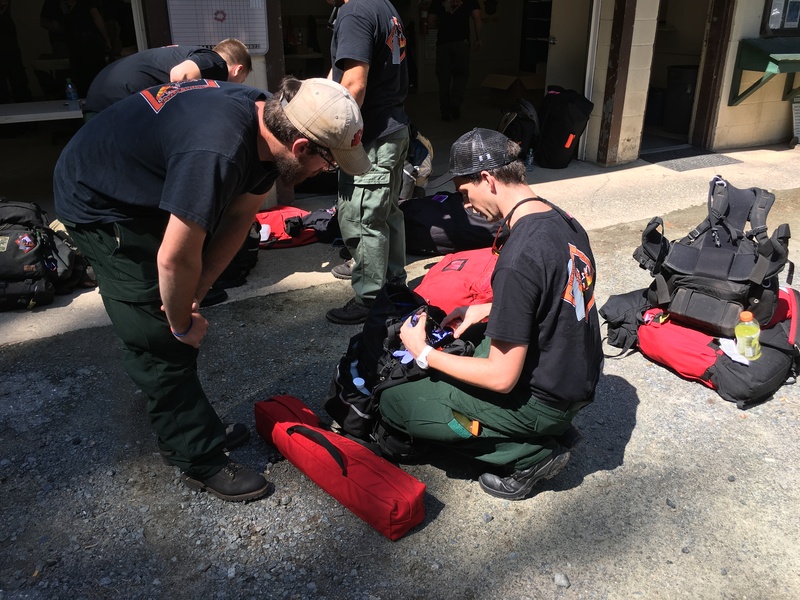 Since 1996, the DDA Forest Service has trained over 600 volunteer firefighters to be part of the 20-person crews it deploys on out-of-state wildfire assignments. Delaware firefighters have traveled to fires in many states: Alaska, California, Georgia, Idaho, Minnesota, Nevada, New Mexico, South Dakota, Utah, Virginia, Washington, and Wyoming. The First State has also sent personnel to aid in national or regional emergencies, such as hurricane relief efforts in Florida in 2004 and New York in 2011. Trained and dispatched by the Delaware Department of Agriculture’s Forest Service, wildfire crews are comprised of men and women of varying ages and backgrounds who represent a mix of public agencies, nonprofit groups, volunteer fire companies, and private citizens. Despite its small size, Delaware has earned an outstanding reputation on the national firefighting scene.